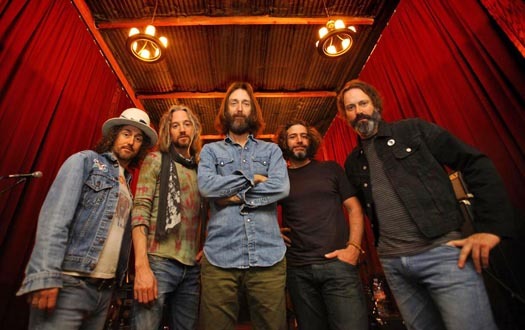 In the spring of 2014, our friends of Chris Robinson Brotherhood released their album “Phosphorescent Harvest” and kicked off their U.S. tour in the SF Bay Area. To celebrate, we tapped the first keg of our Brotherhood Steam Beer, a Golden State Collaboration of handcrafted California tunes and handcrafted California brews. In the spirit of that tradition, we like to think of Brotherhood Steam Beer as an Extra Special Lager (ESL), aka “The Gig Beer” – an easy drinking brew from the first set to encore. In December 2014, we announced the release of Brotherhood Steam Beer in six-pack cans with artwork by San Francisco-based artist Alan Forbes. Use our Beer Finder to search for Brotherhood Steam Beer in cans and on draught at a retailer or fine establishment near you. 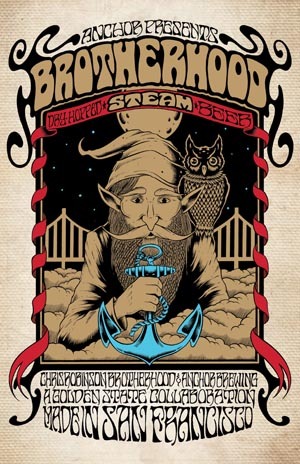 Brotherhood Steam Beer will also be available on draught at select Chris Robinson Brotherhood shows. Raise Your Anchor to great nights of songcraft and brewcraft with a pint of Brotherhood Steam Beer at a CRB show near you! Hey Anchorhead Masters, Thanks for brewing Great Beer like The CRB Beer! Loving It and waiting to hang with you– you know who You are- again in the bar!! Cheers, Peace, Love & Rock-N-Roll my friends, XOX! Was at the recent show in st.louis had the beer. Was wondering if this will end up bottled or not. Also how I could get some? Glad you enjoyed Brotherhood Steam Beer, Brock! No announcements have been made for packaging or distribution of BSB, but we’ll be sure to keep you posted if/when they are! Cheers. Last weekend my Lady Jo and I were in Ybor City for an associate’s son’s band and we had time to kill. They didn’t have Anchor Steam at the venue they were playing at so we walked down the avenue to The New World Brewery because they always have Anchor Steam. We ordered two Steams and were told that they didn’t have Anchor Steam and we were upset since we walked quite a distance after ducking in four or five bars that had no Steam either. Our server at New World said that they had “Brotherhood Steam” by Anchor and we tried it and loved it. I didn’t trust them so I had to ask if it definitely was an Anchor product. They assured me it was and drinking it we knew it was. High quality, great taste, etc. We are looking forward to a place closer to us (Mike’s Tap House in Largo) tapping his keg he bought from J.J. Taylor on December 5th which happens to be our wedding anniversary. That means a lot to us because the first trip we ever made as a couple in May of 1990 we were in San Francisco and went to the Brewery. Anchor Steam (and other Anchor products) forever. Cheers! Great to hear you’re enjoying Brotherhood Steam Beer, Flash. We’ll have to look into getting some more Anchor Steam Beer down your way. Thanks for letting us know. Cheers! Can’t wait for this to become available in cans. I had the BSB in milwaukee and it was sooooo good. Thanks you Chris and thank you Anchor Brewing for making this possible!!!! Curious is this was ever bottled or keg only? Run an independent wine shop in Chicago and was wondering if Glunz will get any? Hi, George. 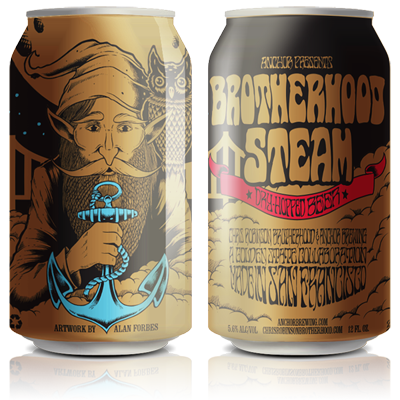 Brotherhood Steam Beer has been a draught-only release thus far, but will be available in six-packs of cans – including Chicago – beginning in early December. Love the Brotherhood Steam. When you drink a beer warm and taste is still there ,you know that’s a good brew!